Monday same format, best three to count. 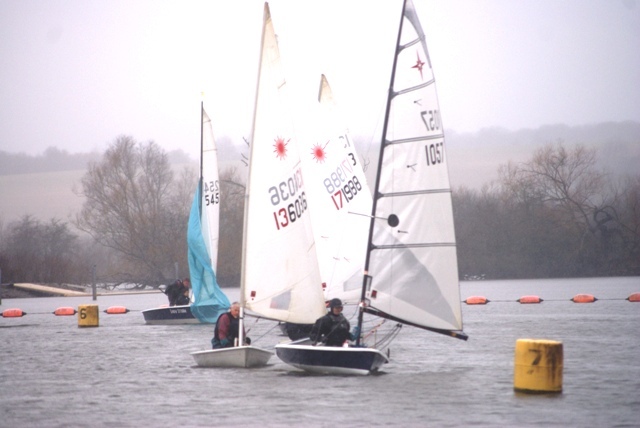 Despite the arctic weather some 10 mad keen sailors took to the water today. Jerry and Chris with a band of helpers set a good course from Tektona, 7p,6p,9s,4p, 3p, enabling a good long beat down the lake. 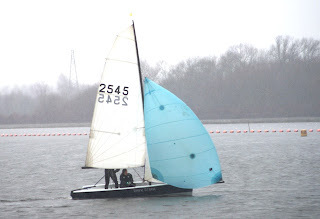 There was much indecision as to what size sails to use among the Lasers, but the brave Jon and Dave were the only ones to go for full rigs, while the others settled for radials, Dave P took Dave I out on the Wayfarer and Newton took Steve in the Laser 2000 – everyone had obviously been keeping an eye on the forecast – 16mph winds with gusts of 26…..!!! Well in the light airs at the start of the race, several boats didn’t get out to the start line on time – too much boat ‘tweeking’ on shore?? – giving Steve the perfect start and the lead. 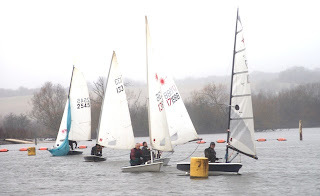 Seemingly there were lot of ‘lucky’ puffs and therefore plenty of close sailing and position changing – the wind gradually strengthened and Dave C managed a spectacular death roll between 9 and 4, followed by 2 capsizes – I bet the water was FREEZING – good thing we had hot water this week!! The finishing places were 1st Chris N, 2nd Jon, 3rd Steve, by a whisker ahead of Roland 4th. Monica sensibly, stayed in the warm of the club house, having a good natter with Kris and treated all the sailors and frozen OOD team to hot soup – hot red pepper was the favourite choice for the day – and rolls – very welcome!! The forecast was cold, wet and rainy with little wind. 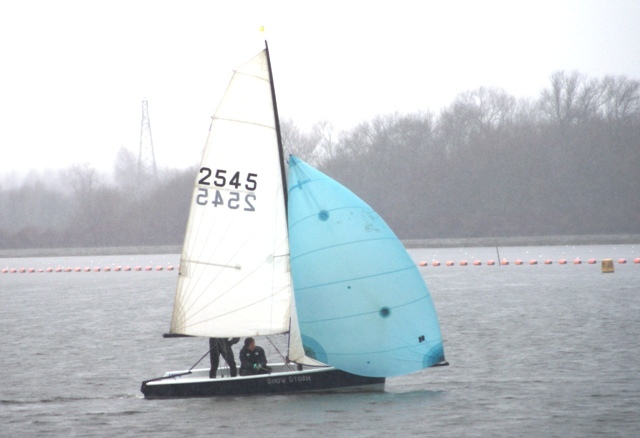 During the setting of the course and preparation of the race the wind was in abundance with the driving rain. Alas at the start of the race the little wind there was came from a southerly direction. The race started at 10.30 and “the 11 boats were off” bobbing along to marker buoy 4. The rain came but little wind so the SOOP and OOD’s positioned themselves strategically in the shelter of the clubhouse with a commanding view of buoy 7. Suddenly on the 2nd run from buoy 8 to 6 a gust which saw some speed but this was short lived . In a 90 minute race most boats achieved almost 2 laps. The morning was over and cold and wet we packed up. “Where is the soup?” Someone bleated. “It’s spring” was the reply “Soup is for frostbite series”…who could tell the difference!! 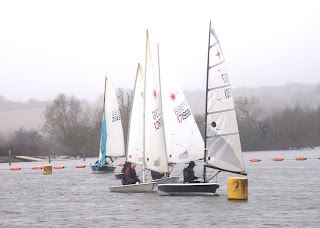 The weather was pretty grim for the second race in the Spring Series. With the amount of rain we have had recently, and more forecast over the next few days, watch this space to see if racing can go ahead this weekend. Last Saturday saw 9 people, all with Power Boat Level 2, doing a safety boat training course, with Ken, Brian and Richard. Despite the bitter cold and driving rain, Elaine, Tracey, Michael, Dave P x 2, and Dene, took to the water promptly at 0930, under the guidance of Brian, watched by Richard from the RYA. The aim of the day was to enable everyone to rescue capsized boats and their occupants. Much to everyone’s delight there was a ‘catering service’ in the form of Monica just returned from her winter sojourn in South Africa, with some excellent photos! Hot, fresh coffees at the morning break, followed by soup and rolls during the lunch break. Picos were used – retrieval, towing, and man overboard were all practiced – with Ken, Dave, Elaine and Tracey volunteering to get wet……..poor Tracey’s zip was not quite closed, so she felt the real cold water, while Elaine with her many layers stayed dry! She looked like Houdini in the lunch break trying to extricate herself from all her layers!! The day included some short indoor class room sessions and the RYA guy was pleased with our instructors and complemented Brian, who led the day. Everyone said they had learned a lot, and were amazed at how quickly they had become rusty. All intended to get as much practice as possible to improve their skills. The trainees departed very promptly as there was no hot water for the showers….!!! The S.O.O.D. and the O.O. D. S assembled at 9 o’clock to organise the race. The forecast was very cold wind. Is this really the start of the Spring Series? Anyway 10 boats sailed down to Tectona. There were only 4 classes of boat today Laser, Laser Radial, Supanova and 505. The course looked on paper to be a very fast one with a lot of planing by the lasers, unfortunately this wasn’t the case. The wind changed direction slightly and the leg sailing down the lake was more of a run. Dave I, was heard to say it was more like a death roll as he disappeared in to the drink. Tried hard as Dave did, he wasn’t able to continue the race! The leg from 3 to 2 was the most challenging as the wind again kept on switching, a lot of sailors capsizing to windward or slamming into irons and finding it a handful trying to get out of it. David C would have to admit to this happening to him. Rowland hasn’t been at the club for some time but he sailed away into the distance showing the rest of us how to sail. Nice to see you back Rowland. The last piece of calamity was explained by Steve and Lynne. It is very important to put the bungs in your boat before the race. The end result of this mistake was hearing Steve had his main sheet trapped and whilst trying to climb in his boat, the boat decided to take off leave Steve water skiing behind! Many thanks to the S.O.O.D. and his team for organising the race in very cold conditions. 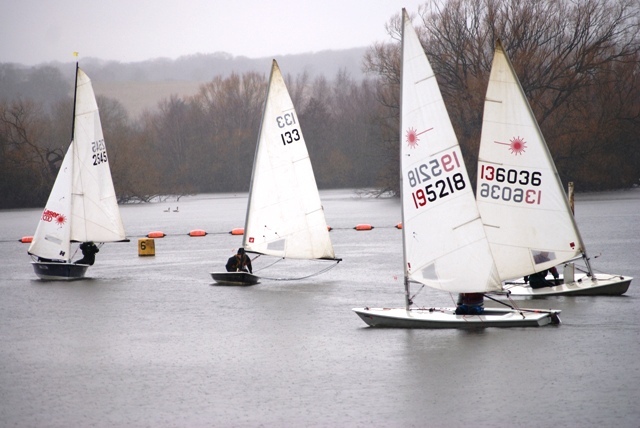 … after weeks of flooding the lake and clubhouse are accessible once more! Come down on Saturday and use the opportunity to check over your boat, clean out the mud etc. Who knows, we may even get to sail!